Stand alone reading machines photograph your reading material, and, within seconds, they begin reading aloud. Easy to use, they are ideal for partially sighted and totally blind people of all ages. The Smart Reader has easy to use controls that allow you to stop, start and go forwards or backwards. All you have to do is position your document and press a button. In seconds the Smart Reader will begin to read aloud to you. 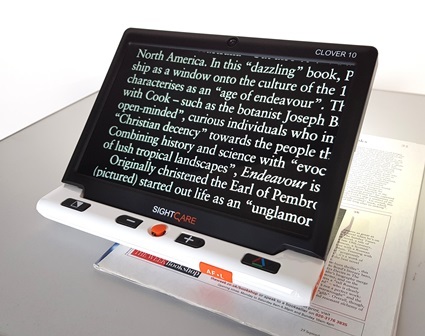 At the touch of a button the ReadEasy translates, within seconds, printed text into clear speech. Read letters, bank statements, books or even curved objects such as tins. Simple tactile controls on the top of the ReadEasy 2 make it easy to navigate your reading material. You can also speed up or slow down the reading speed depending on your needs. The ReadEasy 2 has a faster processor for quicker more accurate reading. It also features more natural sounding voices.